The 70s silver bull took place during a period from a major peak in the Dow/Gold ratio (1966) to a major bottom in Dow/Gold ratio (1980). The silver bull market started in 1971 and ended at the beginning of 1980. In 2011, silver peaked at the $50 level, while in the same year, the Dow/Gold ratio made a bottom just lower than the 5.75 level. Was that the end of the silver bull market? Will the Dow go on to make highs that are multiples higher than the current high, while the silver price collapses? The major problem with saying that the silver bull market is over, is the fact that the price has not even surpassed the high of the previous bull market. One can only begin to consider the possibility that the silver bull market is over when the price has gone a few multiples higher than the 1980 price of $50. Until then, we look for a bottom in the silver price, and the next wave higher in this bull market. Instead, consider the Dow as a peaking bull market, with it being multiples higher than its 1973 high (the high of the previous major bull market). 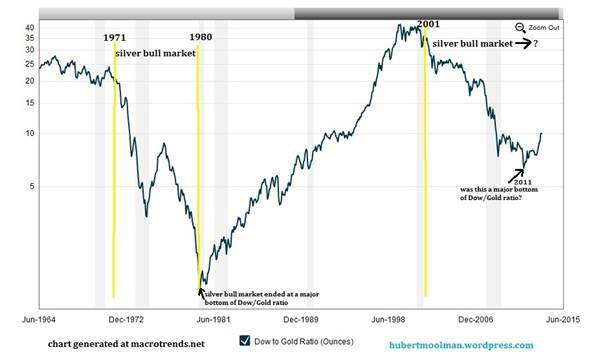 On the graphic below, the top chart is the silver bull market of the 70s, compared to the current bull market of the 70s (the bottom chart). I have tried to line the two charts up; starting from both peaks in the Dow/Gold ratio (it is not exact, but close enough). The two bull markets are definitely following a similar pattern to some degree. Notice that the first major peak in the 70s bull market came about eight years after the peak in the Dow/Gold ratio. The 2008 peak in the silver price was also about eight years since the peak in the Dow/Gold ratio. During the 70s, the peak after eight years appears to have been a significant level, since price really accelerated higher, after clearing that peak. Price also accelerated higher when it cleared the 2008 peak, in 2010. The difference this time is the fact that currently we are having a retest of that peak level (which is not necessarily a bad thing). If price does not go too far below the 2008 peak level ($21), then we have a very bullish looking pattern. The current retest of the 2008 peak level could mean that if we eventually find that bottom, and go higher, we are unlikely to ever see these levels again. The comparison seems to suggest that the rally we had from August 2010 to April 2011, is just a prelude to the coming major rally. If the current bull market pattern continues to follow the 70s pattern, then we could have a peak in the price of silver when the Dow/Gold ratio bottoms. 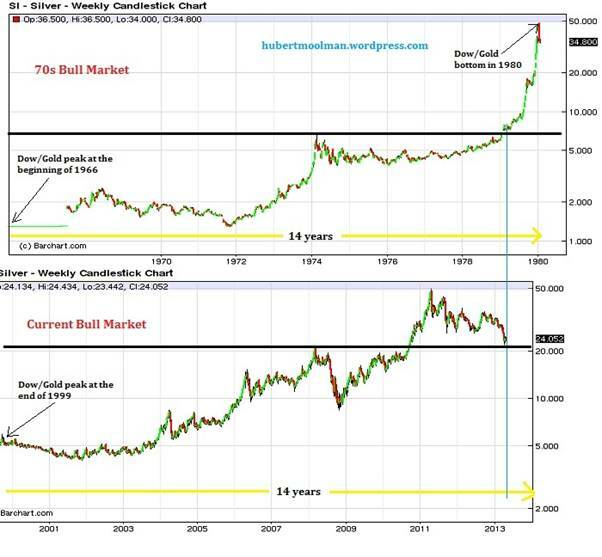 We cannot be sure when this will happen, but should it be about 14 years after the peak in the Dow/Gold ratio, like it was during the previous bull market, then we could have a peak in silver at the end of 2013 to the beginning of 2014. If the current bull market structure continues to follow the basic structure of the 70s bull market, then price should, at least, clear $140.